In Dec. 1999 I had my right knee replaced. My left knee was giving the same pain when I walked. 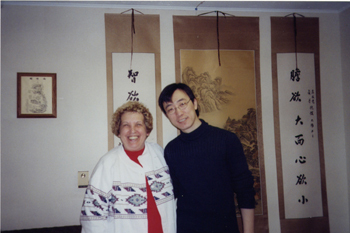 Upon visiting my daughter Beth in Ohio she told me how much acupuncture was helping her back. After six sessions of acupuncture, my left knee feels better to the point where it does not hurt when I walk. My sinus seems to be clearing after years of stuffiness. 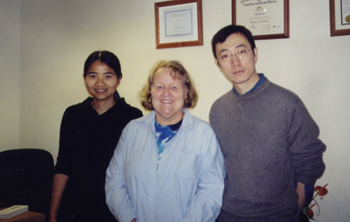 Jing and Gao were helpful in scheduling my appointments for my short stay in Ohio. My name is Joyce Mitchell. I am 52 yrs old. I need knee replacement surgery due to an early childhood injury. The cartilage in my knee is almost worn out. I have experienced excruciating pain when bone contacts bone. In early September 2004 it was so bad I could not walk without crying. New Realm Acupuncture has been treating me with acupuncture since that time. Their treatments have left me pain free. I highly recommend New Realm Acupuncture. They are very skilled at inserting the needles in the proper places and without discomfort. I experiences great relief after the first visit. Additional treatments have improved my condition even further. I am hoping to use acupuncture to avoid getting this knee replacement surgery at least until I am older or until a better; less invasive remedy is available. I chose acupuncture to relieve my pain because the doctors were not helping nor was the medicine they prescribed. I had learned about acupuncture from the various learning channels and decided to give it a try. I’m glad to say it is working and I recommend it to anyone who asks or for that matter I recommend it even if they don’t ask. It is not painful at all nor should it be. If I don’t get any better then I am grateful but I know I will get a lot better. If you have any questions feel free to call me at 475-6222.